Fall is my favorite time of year, and Halloween is my favorite holiday. Even more than Thanksgiving and Christmas. 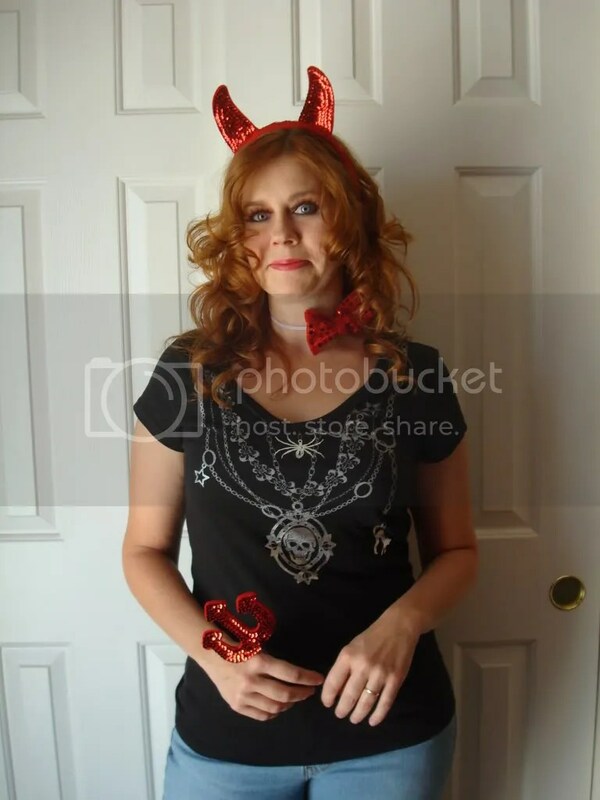 Not in a “I worship the devil” kind of way… I just LOVE the fun that surrounds Halloween! The Fall Fun Fair the town puts on is fantastic! Then, I love getting the kids dressed up, taking them down main street for their Halloween Trick-or-Treating. Of course, I thoroughly enjoy getting dressed up too! Last year I was working (at Walmart… Just had to put it out there), and we got to dress up for several days. One day I did a she-devil kind of thing. 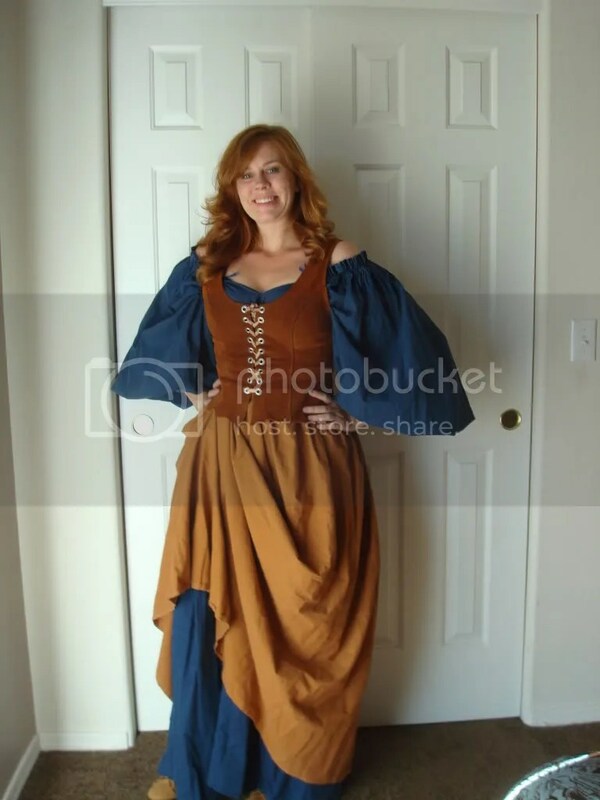 The next day I was a renaissance wench. I LOVE that costume, because a very special friend of mine who is a big part of the ren faire scene sent me the costume to wear and It. Is. Awesome. I bought a witch hat and some striped tights last year to wear for this year, but I just did not find the right dress to wear with it yet. Actually I DID find it, but it was way more money than I was willing to spend. So disappointing, but I’m a cheapskate when it comes to buying costumes so I really can’t complain. I’ll probably scour ebay after Halloween this year and hopefully have the perfect dress for next year. 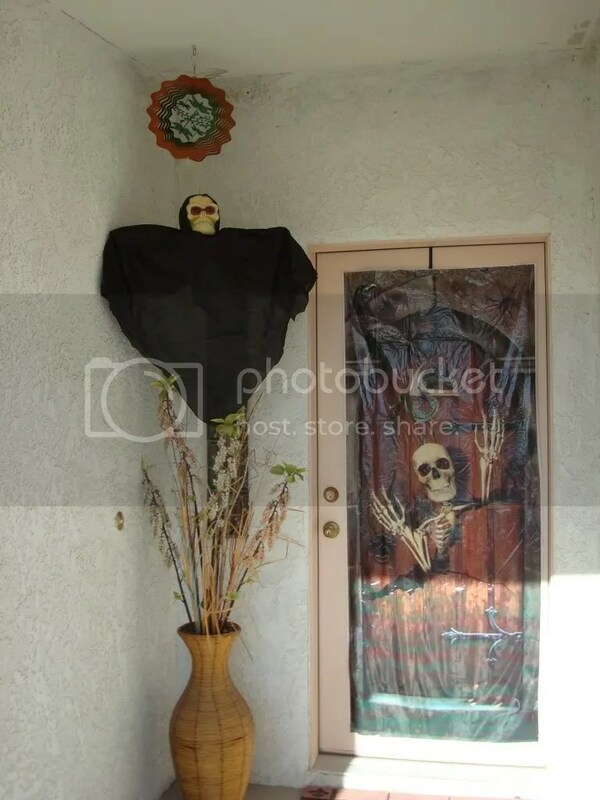 After moving twice in the last two years, I seem to have lost most of my Halloween decorations. THAT is a bummer. Mister bought me a few things last Halloween and I went out today and I got a couple more things. I’ll slowly build up some nice decorations. 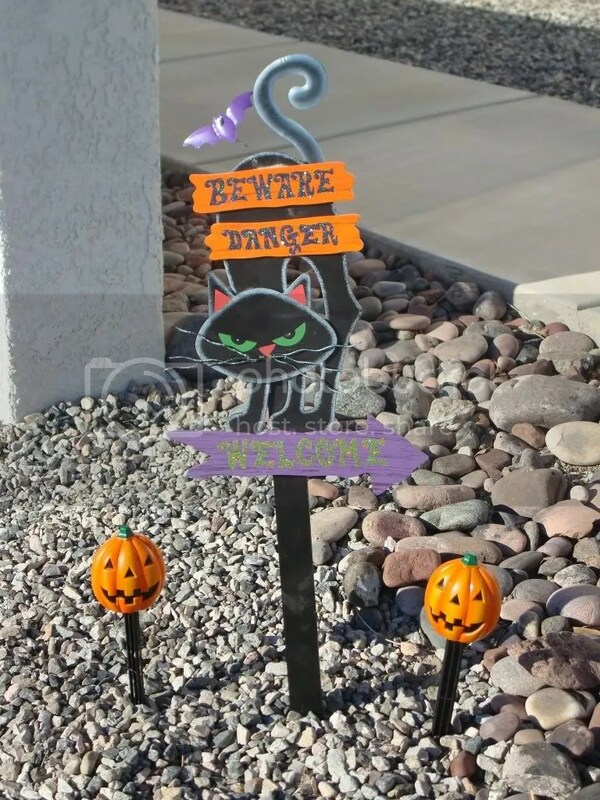 I wanted to do a graveyard in the front yard, but the “tombstones” I had were about 10 years old and too flimsy for the wind. I’m hoping to get some on clearance after the month is over (I know…cheapskate!!). I was inspired to decorate by The Detailed Decorator LLC. 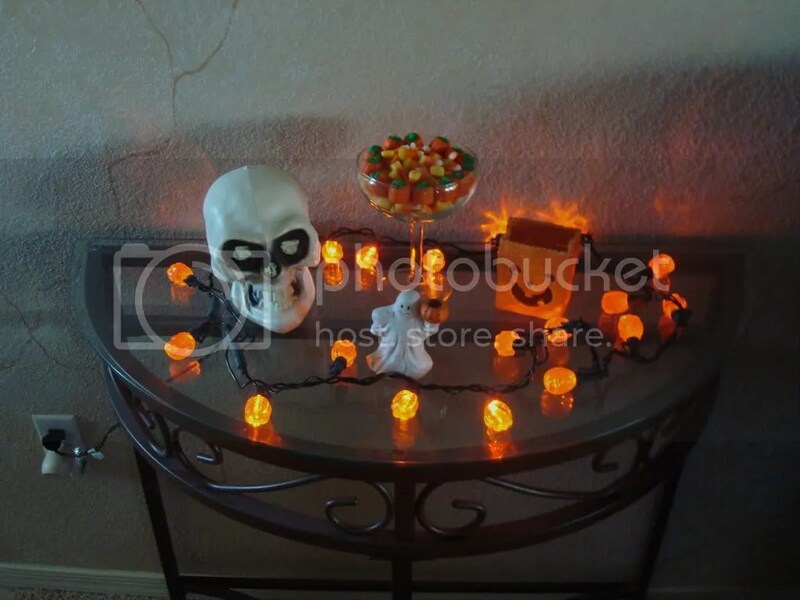 She was having a “Decorate for Fall/Halloween and post your picture event” on her Facebook wall today. I was too embarrassed by my meager decorations to post any pictures on her wall, but it did get me motivated to pull out what decorations I did have and get them put up. 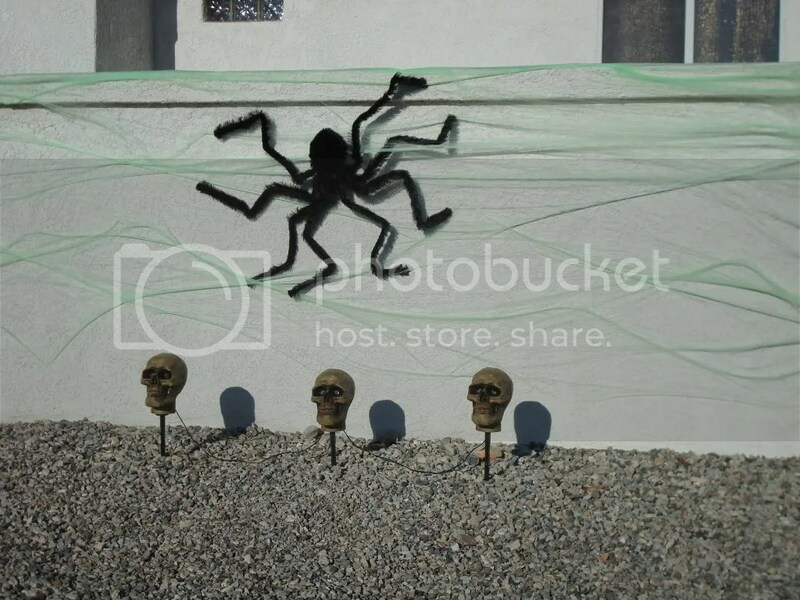 On our outdoor privacy wall I put up a big spider with some glow-in-the-dark webbing. They only had one spider at the store, or I would have gotten two more! I also put up a dorky plastic door cover that doesn’t quite cover the door, but I’m okay with that. I got a nifty little hanging grim-reaper thing too. The kids will LOVE it when they get back from Fall break. I also got some candy corn today for a little display on a table, but unfortunately I keep getting one or two every time I walk by. That is not going to go over well with trying to lose weight. I have to remember they are decorations… SELF-CONTROL is in order!!! I love Halloween, too! It’s my favorite holiday. The renaissance costume really is my favorite, and I’ll be wearing that again this year. If I didn’t have that, I’m sure I wouldn’t be dressing up at all! I really want to do the witch costume, so this year I’ll be scouring the thrift shops and seeing if ebay has some reduced prices on costumes!! Fingers crossed! !